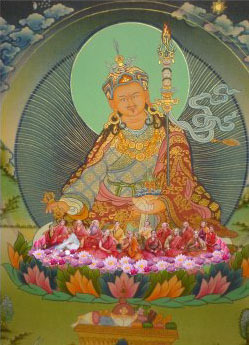 Therefore we invite everybody and everymind, to make use of our services, which are independent, and have the power to reconnect diligent practitioners within one lifetime with their original nature of pristine awareness. Mindtraining offers to all people from all cultures the path to happiness through the develolpement of happiness and compassion. The Realisation of this brings the elimination of mental suffering, which means, we become able to see the up and downs of our lifes, of our world from the point of view of a Buddha or Bodhisattva. So it is not our first aim to change our world, but to realize, how our wonderfull world is working, to understand its inner meaning. Nevertheless it needs a huge amount of exertion to wander this path and it is utterly helpfull for all sentient beings to have sufficient means for livelihood and everyday living. Therefore a mutual materially average income for all of us is also important in the range of results we are working for. It means that we do not ignore the state of being in which one sixth of our world population is living now: poorness, starving, and lacking the minimum means for their survival. If we think of the material richness, which we have developed and we are able to share with goodwill, if we can manage to transform our economical and political system into a fruition bringing tree for all nations and beeings. Each person during the centuries, who has become a Buddha, has become enlightened and was walking the path of freedom, had to find out, how to deal with aggression, passion and ignorance in a proper way. Everyone had to do the same process of transformation, though everytime it was done individually. Because of the transformation of aggression, passion and ignorance into wisdom, any female or male Buddha or Wisdomworker will stop hurting at first herself or himself, and as a natural expansion to a broader surrounding, she/he will stop hurting others. Therefore it is our utmost effort, to support as many people as possible, to enter this precious journey and to support their travels on any step of their individual journeys, as much as possible.